The day after the Liberal Party endorsed a candidate for Gilmore (see page 1), the Labor candidate Fiona Phillips was joined at Surf Beach by Deputy Shadow Leader Tanya Plibersek. 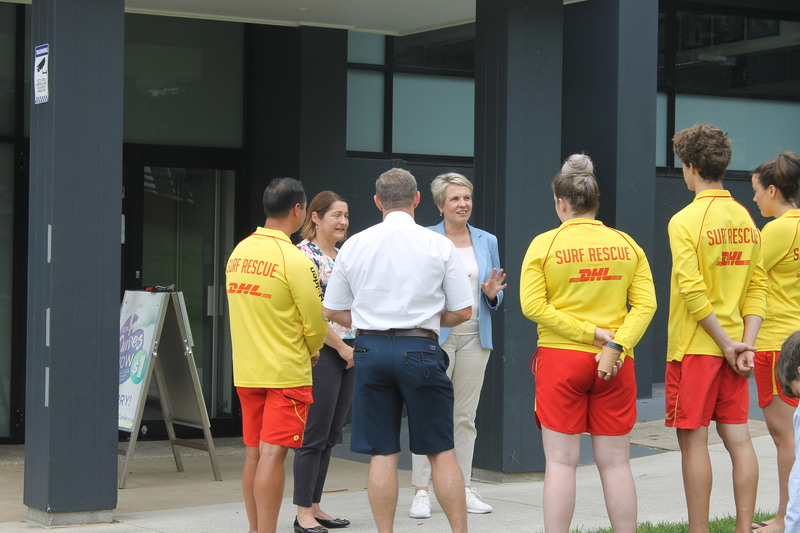 The visit highlighted an election commitment of more than half a million dollars for vital equipment and capital works upgrades to support the activities of Kiama and Kiama Downs Surf Life Saving clubs. upgrade the clubhouse and carpark. “I’m very proud of Labor’s commitment to upgrade equipment and facilities,” says Ms Phillips. “Our local Surf Lifesaving Clubs are community assets and provide much loved and iconic venues for people to meet, learn and celebrate. These facilities need a bit of an upgrade to continue to remain fit for purpose. The occasion was also used to promote Labor’s $46 million Swim Smart plan to deliver more swimming and water safety lessons for students during the school term, but was overshadowed somewhat by interest in Mr Mundine’s endorsement. The Shadow Treasurer Chris Bowen recently opened Ms Phillips’ campaign office in Nowra, and Bill Shorten held a Town Hall Meeting there.